Since the adoption of the United Nation’s Millennium Development Goals, in 2000, capacity development has generated much enthusiasm, though the impact of its practical application appears difficult to measure. Indeed, a number of important studies over the past decade have identified the absence of sufficient indicators and of a conceptual framework as a major obstacle to the evaluation of capacity development activities. In 2011, the World Bank Institute created a Capacity Development and Results Framework, in an effort to provide the tools necessary for practitioners to measure and improve the impact and outcomes of capacity development. 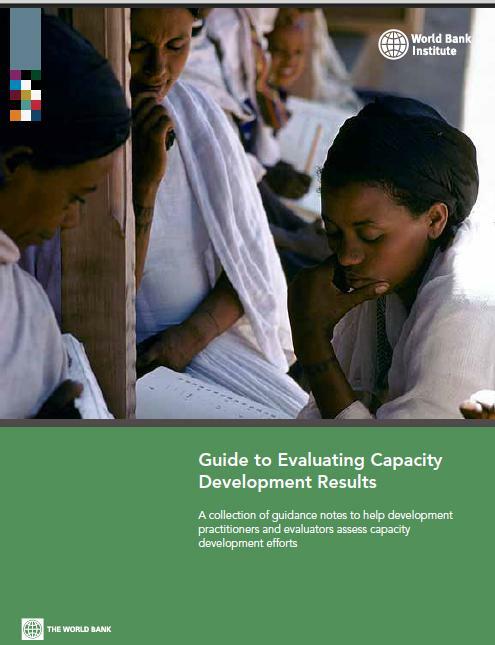 This past December, the World Bank published its Guide to Evaluating Capacity Development Results, wherein it further delineates methods for identifying the outcomes of capacity development efforts as well as successes and challenges specific to certain contexts. This new resource is divided into 17 short Guidance Notes and is very visual, containing graphs, tables and checklists that summarize processes and approaches useful to M&E design and practice. The first section of the report details the process of mapping out the capacity development results chain, starting with a general overview. Later chapters delve into institutional capacity change, followed by intermediate capacity change. The report outlines methods for identifying targets as well as assigning indicators and data sources for each of these forms of capacity change. In the second part of the report, readers are invited to explore outcome assessment. The study addresses data management as well as qualitative and quantitative methods, which have been tested on numerous projects within the World Bank. To consult the World Bank’s Guide to Evaluating Capacity Development Results, please click here. Previous post ← More communication… means BetterEvaluation!